American Constitutional Law, Volume II, Civil Rights and Liberties, 6th 6 Edition AMERICAN CONSTITUTIONAL LAW, Volumes I and II, combines cases, decisions, and authorial commentary to maximize your learning and understanding in this course. 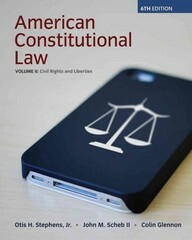 These comprehensive volumes cover the entire range of topics in constitutional law. Volume I examines the institutional aspects of constitutional law; Volume II deals with civil rights and liberties. Each of the chapters includes an introductory essay providing the legal, historical, political, and cultural context of Supreme Court jurisprudence in a particular area of constitutional interpretation. Each chapter also contains several boxed features (labeled "Case in Point" and "Sidebar") to provide additional perspective and context for the set of edited decisions from the United States Supreme Court cases that follow. In selecting, editing, and updating the materials, the authors emphasize recent trends in major areas of constitutional interpretation, as well as many landmark decisions, some of which retain importance as precedents while others illustrate the transient nature of constitutional interpretation. Because the book provides a good balance of decisions and authorial commentary, this text appeals to instructors of law as well as instructors of political science.